INDIANAPOLIS (September 18, 2013) — Serving as the Indianapolis Colts’ practice facility, The Indiana Farm Bureau Football Center now utilizes high-performance Klipsch loudspeakers to dynamically recreate realistic crowd and stadium noise to assist the team in its gameday preparations. Spanning across 35 acres on Indianapolis’ Westside, the state-of-the-art Indiana Farm Bureau Football Center is the daily home to the Colts and team staff. The facility features two outdoor practice fields that offer the team both grass and turf surfaces, as well as a 90,000-square-foot indoor practice arena. 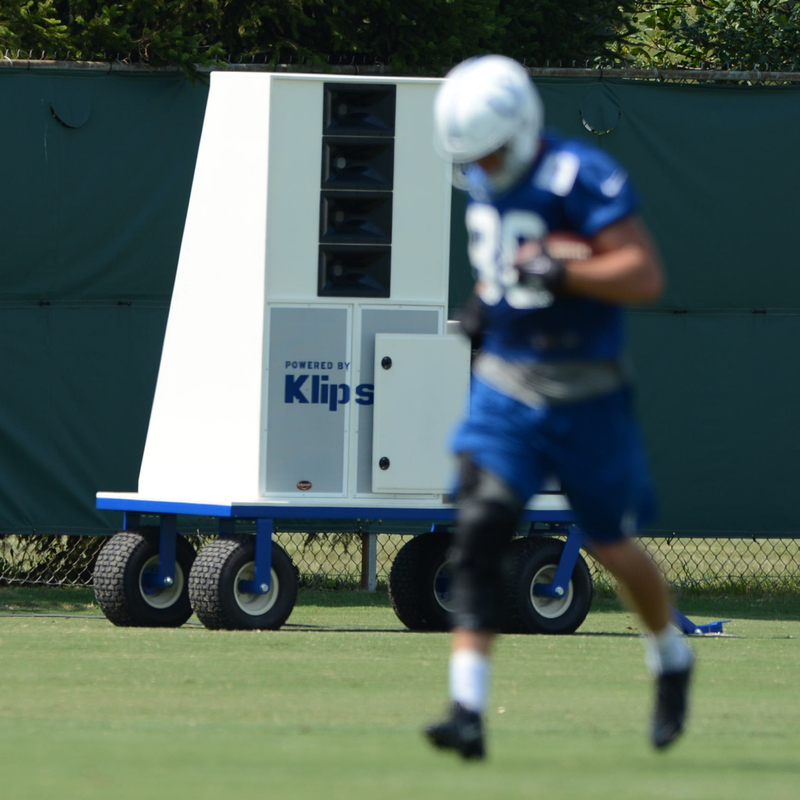 To better simulate the intense levels of crowd and stadium noise the team must cope with at each game, the Colts upgraded its practice facility fields with Klipsch loudspeakers. Klipsch recently reworked the indoor practice field’s sound system using 18 KI-396 two-way flown loudspeakers coupled with six KPT-684 subwoofers, with both product sets situated in a single-mount array. To provide the same sound experience on the outdoor fields, Klipsch engineered three custom, portable systems that can be cart-mounted and positioned around the relevant field. These first-of-their-kind systems each feature an array of four professional audio Tractrix horns. By using the brand’s renowned Tractrix horn systems, the team can create powerful and detailed sound in the sprawling outdoor space. Contributing partners throughout the install included Indianapolis-based Advanced Residential and Commercial Electronics and Indy Cases.